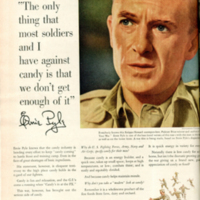 Industry advertisement by the Council on Candy of the National Confectioners' Association; "The only thing that most soldiers and I have against candy is that we don't get enough of it." 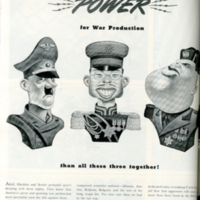 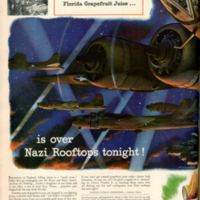 Florida Citrus Commission advertisement; " Because bomber crews must have "Victory Vitamin C", maybe your canned Florida Grapefruit Juice ... is over Nazi rooftops tonight!" 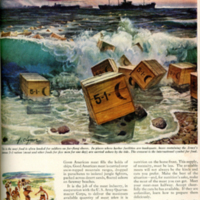 American Meat Institute advertisement; "Meat Ashore!" 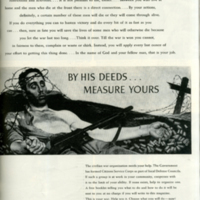 Magazine Publishers of America public service advertisement; "By His Deeds...Measure Yours"
American Gas Association advertisement; "Ladies, here's how you can help cook a tank!..." 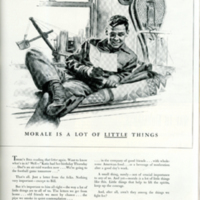 Brewing Industry Foundation advertisement; "Morale is a lot of little things." 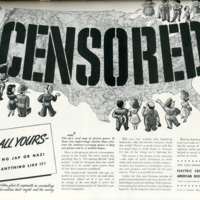 Electric Companies under American Business Management advertisement (94 companies sponsored advertisement); "It's all yours - and no Jap or Nazi has anything like it!" 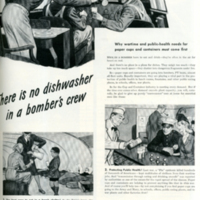 Cup and Container Institute advertisement; "There is no dishwasher in a Bomber's crew." 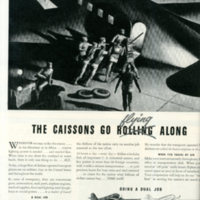 Air Transport Association advertisement; "The Caissons Go Flying Along."